I was feeling excited as the low cost flight came in to land at Ménara airport, I’d always dreamed of seeing Marrakesh, imagining the legendary red-walled city that I’d only read about in novels or seen in those old-fashioned romantic movies. I’d borrowed a paperback guide book on Morocco, clued up on the local info and booked everything directly online…including accommodation at a Riad in the medina. They’d arranged for a taxi to meet us because it’s complicated to drive through the labyrinth of narrow streets in the old fortified city. The manager was waiting as we were dropped off and he led the way through a maze of alleyways to a little guesthouse-style hotel hidden away behind high red sandstone walls. Our Riad, a genuine traditional Marrakesh house, with a dozen rooms on three floors, windows overlooking a shady interior courtyard and splash pool, was beautifully renovated and decorated in Moroccan style. 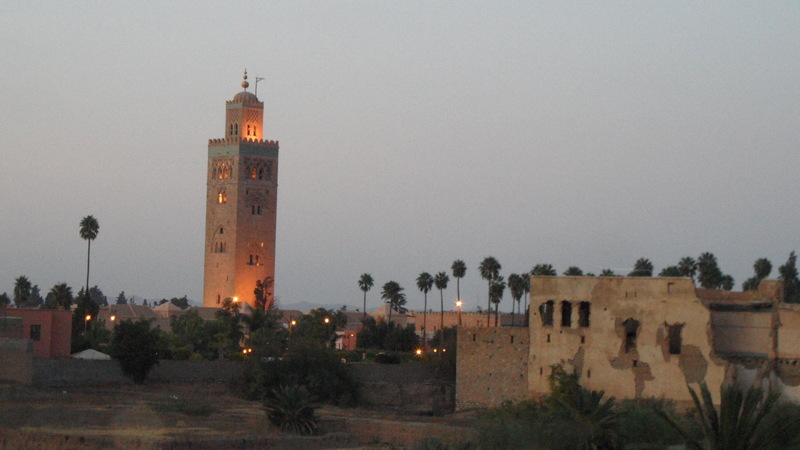 The rooftop terrace had incredible views over the old city quarters to the unmistakable Koutoubia Mosque. Everyone was so friendly and we were given some sight seeing tips and a map of the Medina as we sat sipping mint tea. Once a crossroads for caravans coming out of the Sahara Desert and now a UNESCO World Heritage Site, Marrakesh is an ancient walled city dating back to 1062. Lying at the foot of the Atlas Mountains, the red city was originally built on an oasis and is still surrounded by date palm groves. The impressive orangey-red ramparts which encircle the old city have 20 gateways; we were staying in the southern part of the medina near Bab Agnaou, or Gate of the Blacks, the entrance to Marrakech kasbah. Map in hand, we stepped out into a vibrant world, a colourful mixture of traditions and culture. 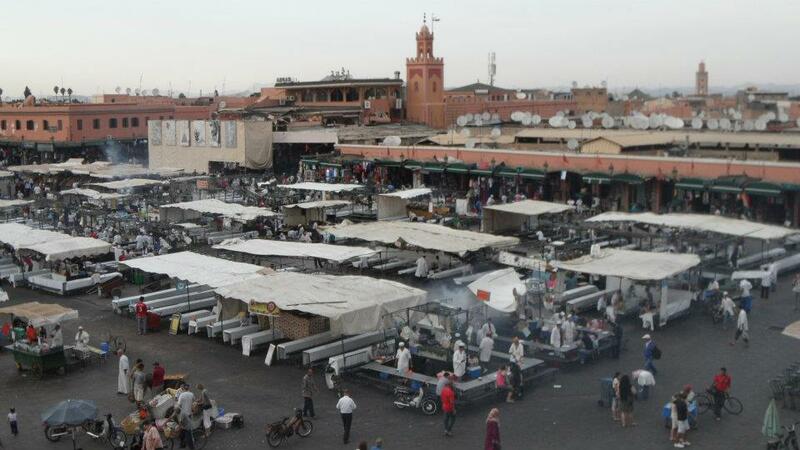 We headed for Jemaa el-Fnaa, one of the most famous squares in Africa and the focal point of Marrakesh life. The huge market place is an authentic open air show bustling with European and Moroccan tourists attracted by the snake charmers, musicians, storytellers and food stalls. We had lunch on the first floor terrace at one of the restaurants overlooking the square and watched on in fascination. We ordered tajine, typical Marrakesh dish made with local spices – there’s a variety of delicious recipes, including chicken with lemon and olives or lamb and couscous, and the ingredients are cooked slowly over hot coals in a coned shaped earthenware tajine in which it is then served. We strolled over to the souks on the far side of el-Fnaa, a traditional Berber market where you can buy almost anything if you have the patience to bargain hard enough. It’s like stepping into Aladdin’s Cave; an endless maze of walkways lined with stalls selling bejewelled slippers, colourful kaftans, silk scarves, intricately wrought lanterns and magic carpets! I’d planned a route but it was impossible to follow so we just wandered through the main souk avoiding the mopeds, push bikes and carts, and found ourselves in what was obviously the wool souk with artisans at work by the doorways of tiny shops, jars of natural bright dyes on display. We watch as a man took natural wool and dipped it into a boiling cauldron of dye, another hanging the skeins out to dry and a boy weaving woollen slippers and hats. Walking on we browsed art shops with beautiful, over-priced, local paintings – my haggling skills weren’t appreciated here – and passed by the legendary carpet souk. I was determined to find the Café Arabe, it was challenging but worth the perseverance! A European’s idea of heaven, this classy Italian restaurant has an exclusive roof terrace lounge bar. A respite from the heaving, hot streets, this was sheer luxury – cooled by a fine mist spraying from the canopy above, we laid back on soft cushions contemplating the view over the medina and enjoyed an ice cold lager! You’ll get fairly disorientated in the souks but not hopelessly lost! You do eventually stumble across what you’re looking for, by chance when you least expect it, such as the famous sheep’s head stalls – I’ll try almost anything but I just posed for the photo this time! And invariably you end back at the main square. In the evening dozens of popular food stalls are set up in Djemaa el-Fna and the atmosphere is even livelier. There’s an inviting display of cooked meats and vegetables on display although hygiene looks a bit risky. 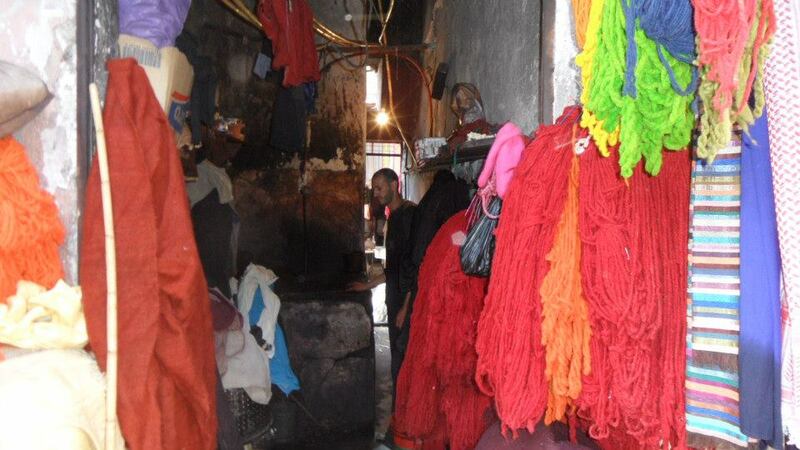 Moroccan tourists were crowed at the most popular places but the dishes were mainly offal, I was told. The Koutoubia Mosque can be seen from el-Fna at the end of a wide avenue which is lined with horse-drawn carriages. At sunset the minaret is spectacular, awesomely beautiful. Unlike other cities I’ve visited, such as Cairo or Istanbul, in Marrakesh non-Muslim visitors aren’t allowed into the mosques. I realize that a mosque isn’t a tourist attraction but I’d have loved the chance to take a respectful look inside to see the architecture and feel the atmosphere. We were staying in a really authentic part of the Medina, away from the main tourist stretch. Going back to our Riad that evening we passed the men playing cards out on the street in front of their local “bar”, “café” or “teashop”? Not quite sure what they call them! Next morning the narrow streets were busy with kids going to school and mums food shopping at tiny kiosks. 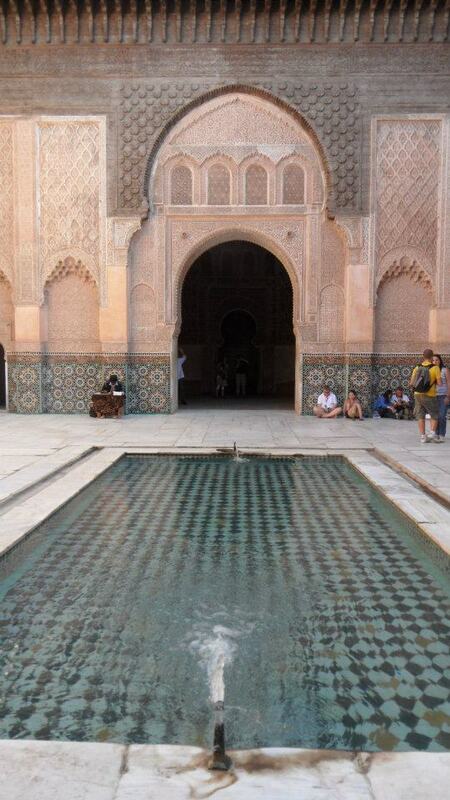 We decided to see the nearby Saadian Tombs which were built in the 16th century as a mausoleum to bury the Sultans. It’s worth a visit to see the Islamic architecture, the mosaic tiles with floral motifs, finely worked cedar wood and stucco decoration. Not following any set plan, we found ourselves in the Mellah (old Jewish Quarter). The unmistakable Star of David was above the entrance to the food market, so being inquisitive as usual I just had to look around. It came as rather a “cultural” shock to see live chickens being sacrificed on the floor in the aisles while nonchalant storekeepers sat back and offered to share their mint tea with us. Back to the square we stopped for a glass of freshly squeezed orange juice at one of the colourful stalls, bought some and dried fruits, and then wound our way through the souks to Marrakech Museum. Housed in the Dar Menebhi Palace, it holds exhibitions of Moroccan art. The architecture is Andalucian with fountains in the central courtyard, traditional seating areas and a hamman, the intricate tile work and wood carvings are interesting to see. The Ben Youssef Madrasa, located to the north of the Medina, once an Islamic college, and more recently a youth hostel, is now open to the public as an historical site. Its 130 dormitory cells cluster around the central patio and pool, where we saw a TV crew filming the ornately carved cedar decoration and the beautiful Moroccan tile work. We stumbled across the Ensemble Artisanal which, according to the guide book, is a complex where youngsters can learn a trade… it was ramshackle, filthy, inhumane… polite, weary looking, young men were working in tiny hovel rooms, handcrafting souvenirs, metal tea sets, overlaid trays, lamps… the other face of the Medina. Marrakesh is renowned for its mediaeval Arab baths, traditional hammams in centuries old buildings where it only costs a few coins to enter. Women and men are traditionally kept apart in the hot baths and steamy saunas, and usually there are separate opening hours for them. There are also several exclusive hammams, spas where European couples are allowed in together and you can enjoy essential oil massages, but the prices are European too! 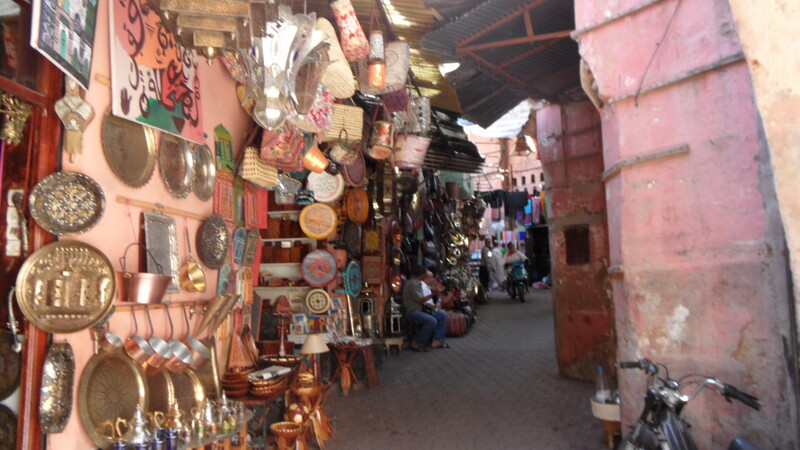 For all the wonder of the souks, Marrakesh is not a place for bargains. I took home some bright fine silk scarves as gifts, and went to a “government authorized” health shop where I bought essential oil perfumes, local spices and natural makeup – charcoal eyeliner, reddish-brown mud blusher and an amazing green lipstick that actually stains your lips pink! I also bought some beautifully coloured decorative tajines at a larger fixed price shop off el-Fna square – on a side- street running parallel to the main pedestrian precinct where the banks, ice-cream parlours, patisseries and donar kebab cafes are located. Returning to our tranquil retreat for the last evening, we bought bottled water and soft drinks from a local kiosk where we were greeted politely. Not once had we been made to feel uncomfortable as westerners, even though we weren’t probably clothed adequately in our sleeveless tops and Bermuda shorts. We sat our rooftop terrace haven in the cool evening air gazing over the palms to the moonlit Koutoubia. Although on our first night, I’d been startled awake by the mosques’ calls to prayer in the early hours, but now I had succumbed to the magic of Marrakesh I found it quite comforting. Marrakesh has much more to offer, it’s renowned for it’s beautiful gardens, centuries old mosques, and several palaces – the Badi Palace, Royal Palace and Bahia Palace are the main ones. There is also the new zone where modern hotels, commerce and trendy restaurants are located. It’s a base for exploring the traditional villages, to see the countryside and waterfalls of the Atlas Mountains, and for day trips including a visit to Berber markets and the “Gate” to the Sahara Desert. I’ll be uploading some of Malysia & Borneo sometime soon! I love your magazine too!